You have two free airline tickets to anywhere in the world. Where would you go and whom would you bring? Why? What are important traits in a travel companion? My wife will always be my travel companion. She shares the same love of traveling that I do and she love to travel non-traditionally like I do as well. If it's right now, India. India looks captivating and enchanting. The food, the animals, the people, the architecture, I would love to experience it all. And ride an elephant. If we get to choose the time of year, IIceland is my #1 choice. If I can only go once, I would like to go a bit earlier in the year, just so there is as much color and landscape diversity as possible. I'd be more than delighted to see more of Peru and going on a ceviche eating marathon!! We would drive around so we will be seeing much more on the way, making memories and finding little moments in unexpected places. Seems like a pretty long trip, but I will be traveling with my husband who is my best friend, so the time wouldn't matter because we have so much fun together. I mean, it's who you have by your side that matters and by my side is an awesome man! That most important trait in a travel companion is truly compatibility! It's what most attracted me to my husband. We like to do the same things, see the same things, be adventurous with our dining, enjoy our time, and most importantly-we like to mix things up. Our trips don't always have to be the same-like beach-time, or museum focused. As of right now (12:59 PM, MDT), I would probably say I want to jet off to Chiang Mai/Chiang Rai area of Thailand. That might have something to do with the fact that I was just doing a bit of research on it in the hopes that it might be our next trip! I would stay at the Anantara Golden Triangle Elephant Camp & Resort-to be the close to these magnificent creatures and be in this breathtaking setting would be an epic experience to say the least. And I would love to see the Wat Phrathat Doi Suthep-it looks amazing! Myanmar! For sure that's my next trip anyway. It's hard to find authentic countries to travel to and I think it mite take the cake for S.E.A. then finish the trip on a deserted southern beach in Thailand! I'll be bringing the wife as usual! I would fly into Vienna go visit Dubrovnik, Budapest Prague and Bratislava. I have been to Vienna before and absolutely loved it, so I want to take my partner in crime, Jess, with me. I think a good travel companion for me needs to share my energy level, sense of adventure, love of trying new food, and love of the arts. I know we would soak in some symphonies, eat some kuchen, visit some castles, and fall more in love with the world and each other (If that's even possible). I would get two tickets to Easter Island and bring along a good friend of mine who has the same quirky sense of humor as me. I find that traveling with a person who you share the same sense of humor with is a really good thing as I often get in to weird situations when I travel. I would go with my youngest son, because he is very curious, open to new experiences always has a solution for the worst case scenarios and is never tired to walk another 10 minutes. Would go to Bhutan the happiest country in Asia, where their king prefers his people happy over the measure of the country GDP. Sounds like a place we could learn a lot about the human-being and the world we live in. I Hope this helped a little bit, if you need to plan any other aspect of your trip, don´t hesitate to send me a e-mail. I would go to the Azores with my sister. Our parents were from there and neither of us have ever been. She is my go to person as a trip companion (sorry hubby) as we have similar likes and our sleeping waking routines work perfect. I would take my husband, Adam (by choice! he's my favorite companion), and we'd fly off to Japan - to hit up Tokyo, Kyoto, Osaka, Nagoya, Matsumoto - basically anywhere we can go and EAT and eat well. We both love food and adore having the chance to try new things. Japan is on the top of our wish list both for the cultural and the culinary experience. I also wouldn't pass up the chance to experience the Tsukiji Fish Market. My wife will follow me to our second home Pigi, and I would stay there a couple of months, and in the wintertime I would go on to Thailand and travel around with a backpack for some months. Thailand, Laos, Vietnam and Cambodia Would be nice. I would take my Mom to Italy. She is Italian, and has never been overseas. Unfortunately, she doesn't like flying so a Xanax and glass of whiskey will be required. The most important traits in a travel companion: willingness to try new things, especially food. My mom would be willing to do that. My husband-- not so much. I would take my wife and fly to Italy to stay in Venice. She talks often about her trip to Italy while in college and I have never been. I'd take my wife to Tanzania to visit the Ol Doinyo Lengai volcano, and any other cool volcanoes in the area. We love seeing the world at work, and there is nothing like seeing a volcano to remind you that the world is still alive and changing. If you travel with me, you'd better be able to move a long way on your own two feet ... and eat anything that someone puts in front of you. I have to agree with Jacey, if you are married you for sure have to take your spouse. That being said I would pick my husband. I have two place, one I have been to before, one new. For the previously visited place I would have to say Munich. Love the culture, not touristy feel, Oktoberfest, and the not hot weather. For somewhere new I would want to go to Tokyo. Just looks so fascinating and like you could never be bored there. Greece the land of paradise:) The healthy food and the sun and see that they do not have a crisis!!!IOPA! Those two tickets are for me and my best friend/husband. We've been to 40 countries and we're addicted to travel. For us, it's all about the food (especially cheese and wine) so we'll fly open-jaw to Athens then begin a road trip to explore the Balkan wine scene. Every glass we have had thus far has been amazing. First stop: Ktima Gerovassiliou's privately owned vineyard in Thessaloniki, then off to Melnik because Melnik wine was Winston Churchill's favorite and their Shopska salad looks fab. Macedonia next door, has been making wines for millenia, so they are worthy of trying too. Afterward we'll see what Albania makes; they have a lot of indigenous grape varieties. Not stopping there, though: we really liked the wines we've had from Montenegro, and since they are at about the same latitude Kosovo and Bosnia and Herzegovina can't be ignored. Croatia will definitely round out the itinerary so we'll fly back from Zagreb. Madrid, no doubt. And I'm taking my girlfriend with me. I went to Madrid before we got together and fell in love with it almost as fast as I fell in love with her. I would love to go back and show her all of the things I loved about the city I fell for fastest. South Island, New Zealand, with my partner. A cool place (all puns intended) safe, wonderful attitude towards conservation, friendly people - a bit shaken up at times, but that juts makes it interesting! Second choice: always Portugal - for the food, wine, port and beautiful scenery! Seoul with Grand Master Hee K Lee. He is well traveled, is familiar with the city and can translate. He is also eager to meet people and try different foods. I travel econominally and simply. I like to take trains, buses and walk at my destinations. I eat simply and eating isn't a big experience for me when I travel. I prefer quiet lodging within easy walk of sightseeing. My travel mate would have to be a non-smoker who doesn't spend all of his or her time texting and emailing. I love to spend my money on things to do (making memories) and meaningful local crafts to bring home, and a safe simple place to stay. One carry-on bag is what I travel with and my travel mate would need to be a single bagger, too. I have only found one friend so far who travels like I do, so she's the one I'd pick. That is so sweet of you, Vinson! 1) New Zealand - I would love, love, love to be able to visit New Zealand for the scenery, the wine country, and, of course, the Fergburger. 2) Cape Town - As the best jumping-off point to South Africa, I would be thrilled to finally have the opportunity to explore this great location. More wine country. Perhaps a safari. It's great that both of these locations are locations we're both dying to go to. Having a traveling companion who likes the same types of locations, and also similar activities makes for some great trips. On the trip, we do like some things different, so that also allows for some alone time in between the together times. Of course my wife would be my travel companion. I can't imagine going anywhere really fun without her. I'm not sure what we'd do with my three year old daughter. Maybe we could hide her in a carry-on. Since the airline tickets are free, I'm looking for somewhere expensive to fly. That means either Tokyo or New Zealand. Either of these two destinations would be great. The decision would depend upon the cost of the rest of the trip, which I assume I'm paying for. To Turkey! I have read all books from the author Kenize Mourad that practically make me a professional on its culture. However I havent get the chance to travel there (it is on my bucket list!). I would take my sister. She is my best friend. She has been with me through a rough 2014. Besides this, she always listens very carefully when I tell her all stories about Turkey, the otomans empire, etc. She deserves it!!! My travel companion must be someone like me. Someone who really loves and enjoys the ride, knowing new people, try new food, and open mind and heart to let new places enter in yr soul. I would meet you in Minnesota with my son so you could show us more of what Minnesota has to offer. We were there for 2 days last year to catch a Twins game. It would be great to catch a Vikings game some day. Saw a few sites and ate at a few good spots that were and were not listed on the Travel Channel. Minneapolis and Saint Paul (Minnesota) were great places to visit from what we saw in such a short time. Why travel abroad when there is so many great places to see in the USA. Croatia Croatia with my lovely boyfriend <3 Because we have wonderful adventures together. He comes up with great plans and also lets the destination inspire amazing spur of the moment activities that make a trip one to remember. Travel is and investment in yourself and in my case an investment in my future with him. My wife is the only travel companion I would take with me. We loved our last visit to the UK we want to return. The UK is where our forbears came from and going there felt like coming home even though we had never been there before. London is a fabulous city with so much history and tradition, we loved all the historic sites and museums. Kensington Palace was lovely as was Kensington gardens. There are so many things to see in London that we didn't see we need to return and see more of them. Like the Tower of London, Windsor Castle, Also go to some shows that are on would be great. I like the open-ended fantasy questions, but the reality is, our travel always has to be closely time-boxed. So let's say we have two weeks -- my wife and me. The tickets are to Zagreb, and our first destination after Zagreb is Plitvice Lakes National Park. After that, ZadarSplit and Dubrovnik. We love scenic coast and ancient history, but Plitvice is the real reason for the trip. I know you can lie with photography, but the images we've seen are astonishing. I would love to go to Scotland with my dad (he's Scottish). I live five hours away from home and I don't get to see or spend much time with my parents as much as I would like to. I think taking a trip with my dad would be the best bonding experience. Plus, he has been talking about wanting a kilt for years and there is no better place to get it than from Scotland! If I had two tickets to fly anywhere in the world, it would be England. I want to travel all around the country visiting the historical football stadiums and explore the culture. A great travel companion would be someone who is sassy, go with the flow, and has an open mind, also able to enjoy every little thing about the country. 2 Round Trip Flights to the Antarcticawith my boyfriend. Why? Well, not just because he's my boyfriend but because out of the 24 countries I've visited in the passed few years, he's been the best companion and the one who has been open to the craziest experiences just like me! Why Antarctica? Well, I'm a travel blogger and get most of my travel funded by sponsors. Unfortunately, Antarctica is too far and too expensive! Can't wait to hear more answers! Buenos Aires with my wife so we could continue our love a affair with the tango, eat the best steaks washed down with a Malbec from Mendoza finished off with some of the amazing Helado that permeate BA followed by a stroll around the funky barrio of Palermo Soho! Other half has to be the only answer for married folks! We'd probably pick Tahiti or Bali, somewhere where the plane tickets are really expensive if we had to buy them ourselves! I would take my wife and go to Shanghai and Hong Kong. We have never been to China, and these cities are high on my list. The combination of food, history, and culture seem hard to beat. The best traits in a travel companion are someone you enjoy spending time with who has a good attitude (because flights get canceled, and plans change) and a willingness to explore a city on foot and by public transportation. I've been torn between two places for this answer, a place I've been Malolo Fiji and a place I want to go, the Azores. My wife, who is my travel companion because like AZ said on Go Fork Yourself podcast you HAVE to take your significant other or there will be hard feelings later on, honeymooned in Fiji at the Malolo resort http://www.maloloisland.com We would love to go back for our 10 year anniversary and maybe take our family with us to share this great place. Friendly people, beautiful weather, and all the water activities you would want when the ocean is right out your door. I have been interested in the Azores since I saw Anthony Bourdain's No Reservations episode http://vimeo.com/35670303 about the Azores. Bourdain makes every place look fun to me, but I enjoy snarky humor and a cold beer so take that for what is worth. In that episode, and from what I have heard from a friend who went there, the Azores is a place like no other. I have been infatuated with that place, and have watched the No Reservations episode enough times that I almost know every word spoke on it. I would recommend Fiji to anyone that asked where to go but with two FREE tickets and no risk, I would choose the Azores. I am guessing that I couldn't go wrong with either. Great question, have fun and safe travels. I would go with my best friend and... I would bring him because he is fun to be around, and he eats relatively common foods, as well as he values gear and he isn't too afraid of adventure. I would go to Arkansas to meet/work with a Youtube Channel that I am a part of. I would take my mom on a safari in the Serengeti, Ngorongoro Crater, and Tarangire National Park, and then head to Zanzibar Town for some beach time afterwards. She's always wanted to go on safari and loves elephants, so nothing more would make me happy to see her experience it. I was lucky enough to do this last year in Tanzania on a solo trip, and without a doubt, I would choose to go back and travel with my mother this time. Would like to celebrate are 52 year anniversary. Thailand with my long time gal pal. I was lucky enough to go to Thailand in 2012 for a lazy beach and climbing vacation. I would love to see other parts of the country. I want my best gal friend to go with me because we've never traveled together. I know we would be good traveling companions because we survived an all girls boarding school together and we're both always hungry! South America with my best friend from college! We have traveled together before and have had great times. Up for everything and ready for anything! A good attitude, sense of adventure, and flexibility is key. To me, almost every idea sounds fun! So someone who gets on board and brings their own ideas is so valuable. Challenges you to go outside your comfort zone, but can also pick up the slack when you've had enough (and vice versa!). Has the same ideas about money. How much money you spend on a daily/weekly basis is a huge thing to figure out beforehand. It's a big indicator of what kind of level of comfort you're expecting and how much discomfort you'll accept! Is grateful for the trip. Gratitude makes you bring your A-game in terms of energy and attitude. Hi there, i would like to go in Usa exactly in Chicago city. Please, give me a tickets for this place. Thank you Andrew! I'm waiting you! Have a great day. I would take my 17 year old niece (from south of Duluth) to her choice of destinations. She says Italy. She is becoming a great photographer and I'm excited to encourage her passion. I want her to learn to love travel like I do. A good travel companion is one open to change, the unexpected, resilient, observant and interested. My goal would be to return with her knowing the world is available to conquer. My best friend, because we've been travels together many times and he is my best companion. I would bring my beau of course! :) I think a good travel companion is flexible, curious, energetic and patient. I would want to go to Hanoi Mumbai or Thailand. I have never been anywhere in Asia but love what I know of their culture and enjoy their cuisine. Sydney, Australia. I'd take my son, now almost 2 years old to meet his older sister and her son, my grandson, now 6 month old. I live in Kampot, Cambodia, where my son has two older brothers, the younger 5 years the older 9 years, whith their beautiful mother. It would be great to be able to take all of them, but alas, currently I don't even have the money to get myself there. I think I would really like to take my husband to Hawaii with me so he can see all the beauty and why I keep trying to move back. Great food, FANTASTIC people, and beautiful weather. My other choice would be Prague for it's historical beauty and to drink fabulous brew! Trip will be with my wife. The first time I saw it on National Geographic, I was very very young. I have been in love with it since. The other location I keep dreaming about is New Zealand for backpacking. 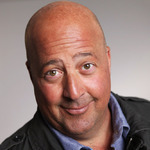 Oh very good question Mr. Zimmern . It is a tough one to answer because I have a few traveling partners but to answer this question I would have to say my mom. She suffered from an autoimmune disease some while back and never got to fulfill her dreams of traveling all over Europe. She recently got to travel the USA with my sister so I would take her all over Europe and first place would be Rome. I know she has always wanted to visit Italy, especially Rome and Vatican City. She is willing to see as much as possible and eat her way through new travel destinations as well as try all the " Bizarre Food" ;) that you wouldn't find in the USA and other places. So she would make a very good travel companion as far as Im concerned. Definitely would be my wife, as she is a great traveler and an excellent companion on a long flight. We have been to Europe many times, Hawaii and all over the United States, and we are very supportive of each other. We would want to fly to Guam, as I lived there for several years while I was growing up (my father was in the Air Force and stationed there) and we would want to stop over in Hawaii on the way.